They come up in late summer or early fall, when everything else is going down hill, and last well into the spring, looking amazing for me from at very least from October to May -- the very period of time that is hardest to keep looking good in my climate. What's more, they perform like this in the dry shade under my maples, not minding the absolute lack of water in the summer since they're dormant then anyway. They flower too, very profusely in September and October. I like the flowers, but the leaves are so much lovelier that I realize I don't even have any photos of the flowers. There is a lot of variability in the leaf patterning. 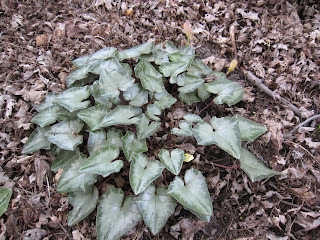 Arrowhead Alpines has a wide range of leaf types, and I love going and picking out my favorites. This is one I picked out this spring. I love the complexity of the patterning. I also love their silver leaved strains, where the silver covers almost the entire leaf. They are not as cool up close, but make a better statement from a distance. Seedlings! I've got two more pots like this, totally maybe100 little seedlings. I'll let these guys over winter outside in a sheltered nook, then divide them up into individual pots once they go dormant next summer. I can't WAIT to see what leaf patterns they have as they mature. I'm not sure what the critical factor for success was -- I'm guessing it was the combination of very fresh seeds that hadn't dried out, and matching the timing to their natural growth cycle. In anycase, now I know how to get lots more cyclamen, which makes me very happy. I might buy a few other species this year, so I can harvest fresh seed from them as well. Because I think it is physically impossible to have too many hardy cyclamen. Or most any other plant, but especially cyclamen. I just received a few white flowered cyclamen from a neighbor who has had them seeding around his bed for decades! The effect is pretty spectacular at this time of year. How cool. I love the leaves on those cyclamen. So different from what I'm used to. Kudos on your seedlings. I remember reading how to start cyclamen from seed and felt a bit discouraged by the effort needed. I love Cyclamen - alas, so do my squirrels. Those silver-leafed ones are just fantastic. The only Cyclamen I was familiar with were the ones I often see planted en masse commercially, used essentially as annuals. Yours do have a beautiful leaf. 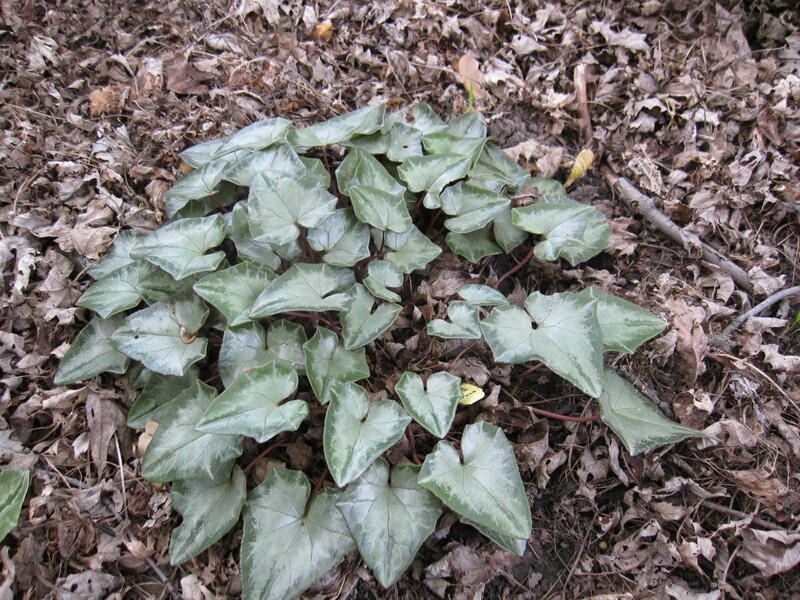 I was reading up on plants for dry shade and saw Cyclamen on someone's list, but wasn't sure about it. I'll have to buy some now for my dry shade area! Absolutely gorgeous, cyclamen must have some of the MOST beautiful foliage of any plant...just stunning. I hope the same vendor is in Chicago this year for the Flower Show because I want to get more of what I got in March. I love the white flowered ones -- about half my plants are white, half magenta, so we'll see what the seedlings look like. Yeah, they're not as easy as some seeds, but so worth it! Wow... you must have seriously evil squirrels! Mine munch on occasional tulip and most of my corn, but they've left the cyclamen alone. The ones you see in mass, annual plantings are a different species, C. persicum, and aren't winter hardy. C. hederifolium is great for dry shade! I've found them extremely easy, provided I buy them growing in a pot, not as a dry bulb. They don't seem to like drying down like a daffodil or tulip. Wow, I didn't know there was such a thing. I have added it to my mental "gotta have" list. Thanks!